It’s hard to get rid of something if we think we can use it at some point. Saving things just in case is saving me money… right?? If you can find it when you need it. Or if you remember it when you need it. But for the majority of us, we don’t remember all the things we have, and so, when we come to something we need well if the one we kept isn’t remembered or found, we just go buy another one. The Minimalists have a rule that I have used often when I teach- the 20/20 rule. If something cost under $20 and you can easily get ahold of one within 20 minutes of your home, don’t bother keeping it just in case. When we look at the things we want to keep “just in case” it is typically very inexpensive items that we think we should hang on to. In fact, most of the items we fret about keeping aren’t even worth $5. What are the types of things that you keep just in case? Extra screwdrivers? Coffee mugs? Expired spices? Worn out clothing, pots, and pans that you already bought replacements for…? We keep so many things that cost very little to replace, most, in fact, can be picked up at a second-hand store for pennies. So what exactly is it saving us? Do we need 20 extra coffee cups just in case one breaks? It’s not saving us money, it’s costing us space! There are negative consequences when we focus on the “in case” part of that sentence. How does that affect our outlook if we keep “fat clothes” just in case we need them again? Is that really a healthy reason or thought process? Does that help you stay focused on your health and where you are happiest with your body? Or does the thought make it so that the idea that you probably will gain weight again hang over your head? How about those kitchen items? Does it warrant keeping 10 pie pans in the cupboard, does it warrant them taking up all that space if you use them once in 20 years? Should they really belong there? Is there a better use for the space in the cupboard? Think through it: will they be an accessible place so that you can easily get them if that time comes? And if not, will you want to dig through all the boxes to figure out where those pie pans are so you can use them? Or will you just say “hang it!” and buy a bunch of foil pie pans or borrow them from family members? Wouldn’t it just be easier to keep things that you use regularly now and deal with whatever comes up later… If it comes up? I have no doubt that someone out there can use those pie pans and be thankful that they found them cheap or free and didn’t have to buy a new one. As a Christian, I believe this falls into “don’t worry about tomorrow, for tomorrow has enough worries of its own.” If we trust that God is capable of taking care of us, why do we want to store things up? Are we afraid He’s going to be too busy doing more important things to take care of our simple needs? Doesn’t He care for a sparrow? Also, think through: what is the worst that could happen if you get rid of those just in case things? What is the absolute worst? If you only have 3 coffee cups and 1 broke, how bad would that be? If your stapler stopped working and you didn’t have an extra, how much of a bind would you be in? Addressing the just in case issues is a process of learning to be honest with yourself: what you want your home to be like, what your comfort level is, how you actually spend your time. What if the item is worth way more than $20, but it’s an extra? Sometimes we keep things because we spent a lot of money to buy it. Consider the Rainbow Vacuum… If you bought it, but now hate using it and you have a Dirt Devil that you like better, every time you reach into the closet and get out your Dirt Devil you see the Rainbow vacuum sitting there, taking up space, but it was expensive and you feel bad getting rid of it and hey, if the cheap one breaks down, you have the rainbow as a back up. But if you hate using it, it’s a safe bet that you will go out and buy yourself another Dirt Devil instead of pulling out the Rainbow. If you are honest with yourself and find that true, why on earth do you give that Rainbow vacuum space to stay in your home? Is it useful to you? Do you feel it deserves that space it takes up? 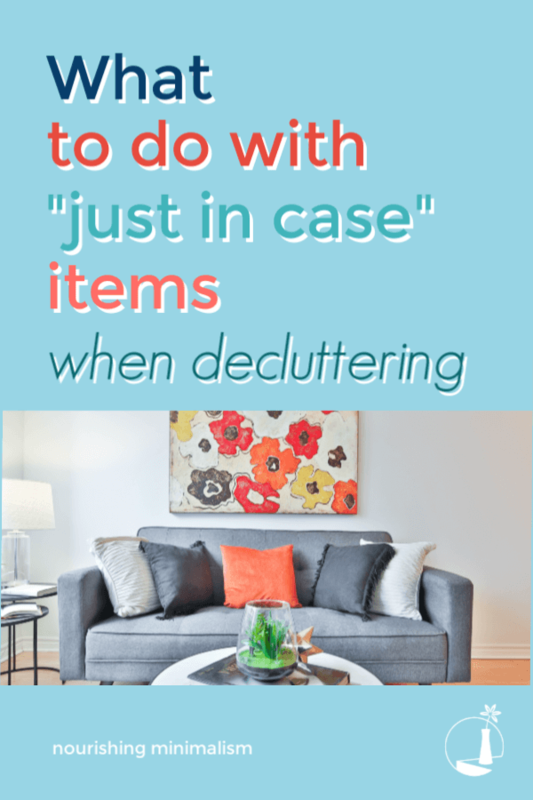 Take some initiative today and get rid of a few of those just in case items you honestly know you won’t use. I like the 20/20 rule. It reminds me of the rule I use to help me travel light. If my destination has the inexpensive items I need and enjoy easily available I don’t pack it. I just purchase it when I get to my destination to save space. I really struggle with this but recently got rid of my just in case clothes and have had NO regrets in the couple months since. Great advice! I don’t have much trouble with “just in case” items. I’ve found it pretty easy to get rid of extra supplies and things I don’t use. There’s a lot of info out there given to this topic and also to sentimental items. The thing I have the most trouble with that I rarely see addressed are the things that I just really like–for example, my music box collections, my cat figurines, vintage and antique items from flea markets. clothes I like, . . . Those aren’t “just in case” items, but they’re items I really like looking at. I have too many, though; how do I deal with that? And I have tons of coffee cups–NOT just in case I break some, but because they’re cute, cool–I really like them! I can easily get rid of boring coffee cups. I’ve downloaded your workbook course, Rachel. Is this issue something that they address? Just having too much decor/collectibles, even coffee cups, etc . . . that I really like?? I sure hope so. Thanks for listening! When too many things “spark joy”, it can be overwhelming. Consider this approach, define the space available for your collection to live. Decide how much space will be dedicated to your coffee cups, for example. If they all fit & you’re not crowding out other needed items, it’s all good. If they take too much space, it’s time to cull the herd. Hello. I enjoy reading your blogs. When I saw the title of this blog, “just in case”, I thought it would be about emergency preparedness. With the recent floods caused by hurricane Harvey and the eathquakes in Mexico, I have been worried because I have not prepared my family for disasters. I am trying to adapt to a minimalist lifestyle and I don’t store excess ‘stuff’, like extra water and food. I live in California, so our main threat would be earthquakes. As a minimalist, what are your thoughts on emergency preparedness and do you prepare for disasters? I love the scripture reference and your Christian outlook on this subject. I want to simplify because I believe that is what Christ teaches us. I am looking forward to more of your blogs. I just found you and I am so happy I did! Thank you for addressing the issue of trusting God. I struggle with this all the time, I know I truly need to work on trusting Him and knowing he cares enough to supply all my needs. Thank you for your article. Yes! I am glad you brought up the issue of trusting God. I used to feel guilty for not hanging onto things I might bee able to use someday because I thought I was being a bad steward! Scripture tells us to give, and I was feeling guilty if I didn’t keep! It feels so much better to know I’m not stashing things away until they are of no use to anyone. 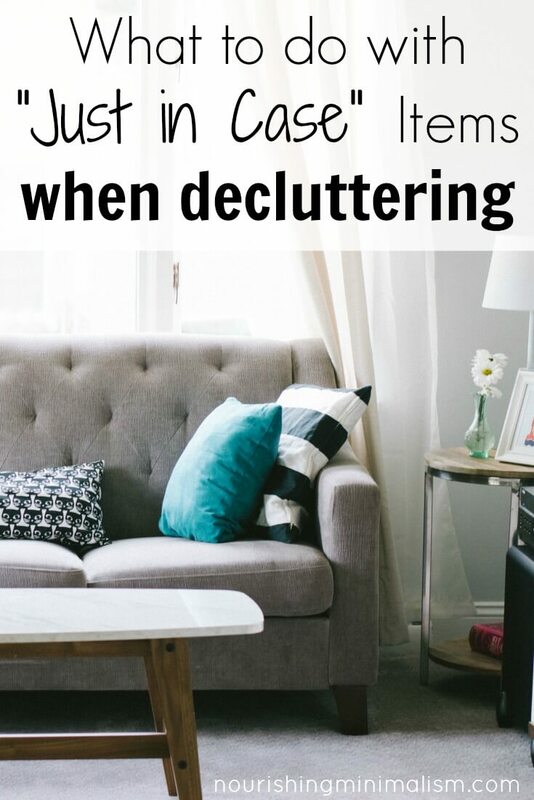 This is the best Clutter Clearing article that I have ever read! It makes the most sense!!! This is what I needed though!!! I have some excess kitchen items that I feel I can now part with now! Thank you so much!!! Where do I find your workbook course to purchase? Hahahaha. The rainbow vaccum! Good example! I am a “sentimental keeper”, too. Coffee cups that remind me of a trip I took, a favorite friend who gave it to me, one that my Mother had (I pretend we are having coffee together when I use it!). I don’t have any plain ones. Of course, I don’t need many but…how do I decide which to keep and which to toss? I have used a few as storage for pencils, paint brushes, etc. but I still have too many in my kitchen. Just a suggestion, and I think I read it in The Minimalists..look at the array of mugs, decide how many is a reasonable number and keep your favorites. Which mug or couple of mugs do you reach for always, given all the options (I bet your mom’s mug makes the cut)? You may have to do some serious thinking, but the “reminder” mugs — aren’t there other ways to remember a great trip? And I’m speaking as a person who formerly loved to buy fun and reminder coffee mugs, so I know where you’re coming from, really. Good luck! This! One exception. Chronic illnesses sometimes cause rapid cyclical weight fluctuations that cross a few sizes. My solution is that most of my clothes fit me in all my phases, 18-22 because they’re either stretchy, loose, or have things like laces or buckles for cinching. But I keep a pair of trousers and a pair of jeans in size 18 and size 22 just so I’m not feeling gross while my body is misbehaving. Thanks for sharing how to manage that Sarah!